People walk past Foster Dance Studio, located at 915 Foster St., on Monday. The studio is expanding and hopes to see class enrollment increase as a result. An Evanston dance studio is planning an expansion to allow for an increase in enrollment and available classes. 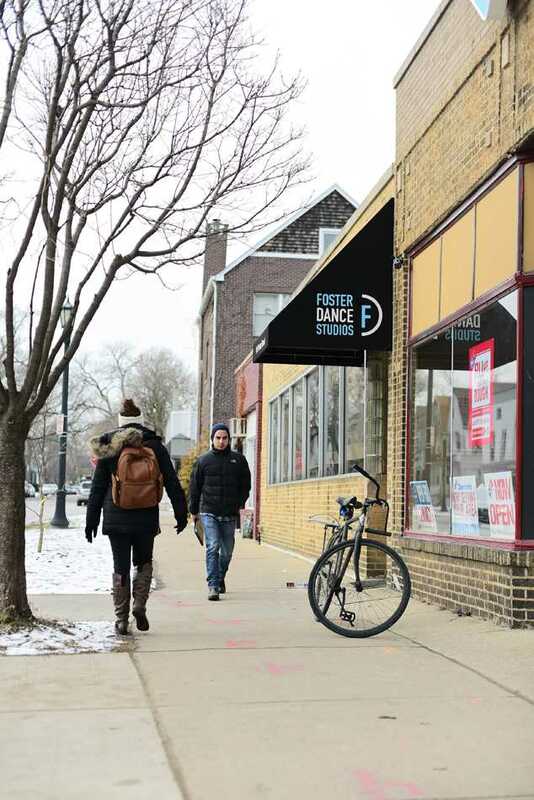 The city’s Design and Project Review Committee approved a few weeks ago the request of Foster Dance Studios, 915 Foster St., to expand into the rear of the building it currently occupies, said Kathryn Ebert, the studio’s executive director and co-founder. The space it will absorb has been vacant for a while, but previously functioned as a warehouse for a bookstore, Ebert said. The studio opened three years ago and did not previously have a need for expansion, but Ebert said she thinks now is the right time because the business is growing. Ebert said the plan is to turn the two-story space into one big studio on the ground floor with a changing room and teachers’ lounge upstairs, among other amenities. Sarah Ehlen, a Medill junior, said she is excited about the studio’s expansion because she takes frequent classes there as a way to supplement her dance minor. Ehlen said she thinks the bigger space will allow the dancers to move more freely and constantly because they often have to complete combinations in smaller groups, causing others to stand around and watch. “I think it will lead to happier classes and hopefully the opportunity for more classes,” she said. Ebert said she has received a lot of support for the addition from current students and others in the community. Mark Muenzer, the city’s director of community development, said he thinks the studio’s growth is a positive development in the area. Ebert hopes that the expansion will be completed by June but expects it will take until the fall, she said.